Do you find that your students learn better and pay more attention when they are entertained? Do your students know that physics can be a lot like magic? Use this light experiment to interest your students in physics.Follow the directions below to do this physics light energy experiment with your students. Click on the image of the bird below. Print the image using a color printer. Print enough copies so that each student has one. Ask students to fold the paper in half so that the bird is on one side and the cage is on the other side. Ask students to look at the birds eye for twenty seconds. After twenty seconds,ask students to turn the paper so the cage is displayed to them. Students should see a blue-green bird in the birdcage. Discuss the following points with students. The image of the blue-green bird in the birdcage is called an afterimage. The afterimage is created because blue-green is on the opposite end of the light spectrum from magenta. After looking at magenta so long, when the eyes look away from it, the brain filters out all magenta and what is left is the blue-green color. Discuss the color spectrum with students. Can this experiment be performed with other colors? Encourage students to create their own afterimage using light energy. Using items they are familiar with can be a fun way for students to develop an interest in light energy. Discuss the afterimage process with the students. What happens when they look at a light too long? Do they get an afterimage of the light when they look away? 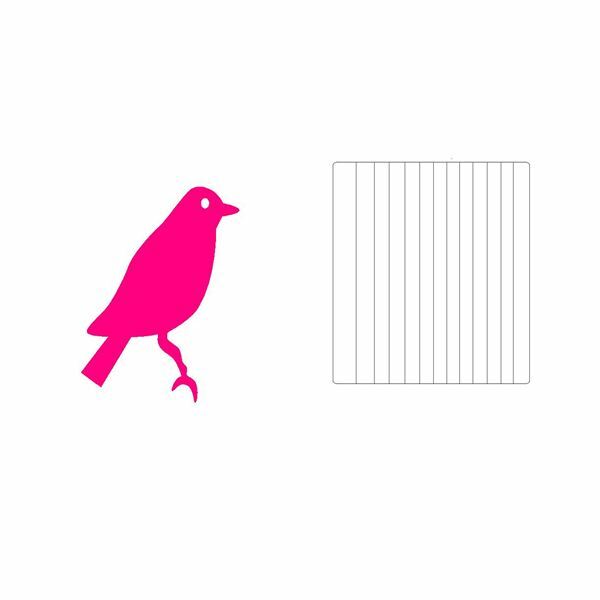 If the bird would have been blue-green would they have seen a magenta bird when they looked in the cage? Experiment using different colors with your students. Show them how to enjoy science!